Vietnamese spring rolls for the weekend! I love welcoming the world into my kitchen , especially by travelling through flavours. Exotic vanilla, burning chillies, unexpectedly flowery cardamom, warming cinnamon or cloves… The appeal of far-away flavours and food is unabated by their modern availability! Though I wish sometimes that I could enjoy them with the trepidation the great explorers of past times must have felt when coming back with the first plant of cocoa (Hans Sloane) or the first root of ginger (Marco Polo)… Now, that must have been something! For the weekend, I give you a well-loved Vietnamese recipe! Thanks to the lovely Bhopa who taught me to roll them properly during the summer, mine look now as delicate and neat as they taste. No difficulty at all. Easy peasy recipe! Though I’ ll upload a drawing if I can. Mix one equal part of each in a dipping bowl and serve that sauce with the warm rolls, some fresh lettuce leaves and sprigs of fresh mint. First, boil some water and soak the rice noodles and the mushrooms, separately in two bowls. Then put the other ingredients in a big bowl and season to your taste. Don’t forget the pepper and fish sauce. Add the beaten egg to link it through. Drain the noodles and the mushrooms and add them in. At this stage you can either chop the whole lot very roughly with a sharp knife or put it for a few seconds in a food processor. You want a rough and chunky mix in which each ingredient can sing its own tune and where none should overwhelm the others – least the noodles! 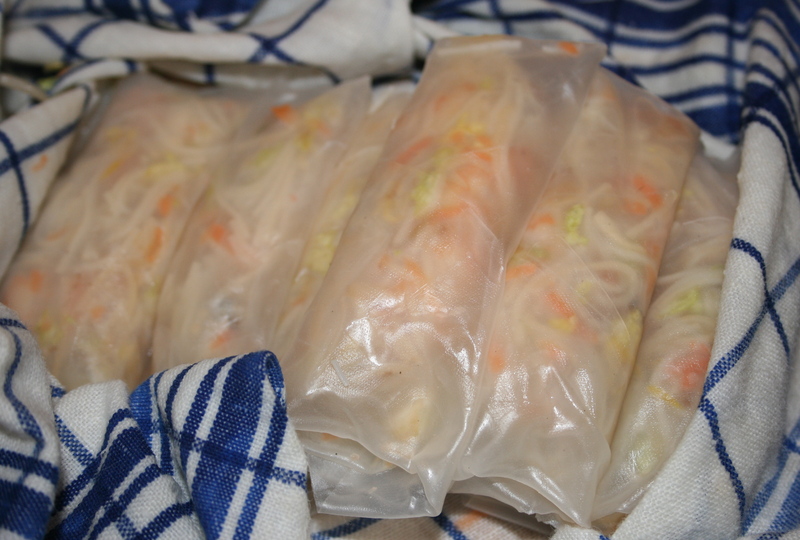 Leave to rest for one hour in the fridge – This is great to prepare in the afternoon and then you just have to roll them in the rice paper and fry them up just before sitting down for dinner. When you are ready, prepare a tray full of water and a wet cloth: Dip the rice paper in the water on both sides, lay it on the cloth and put a small spoonful of stuffing about three fingers from the top end. Bring down the top over the stuffing, then fold both sides over this, joining in the middle and start rolling down as tight as you can. Reserve each of your treasures under a second cloth. 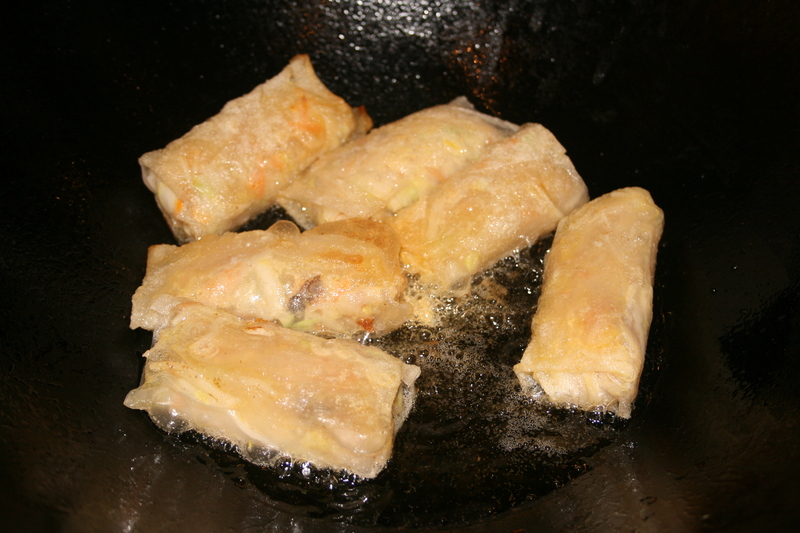 Once you have used up all of the filling, heat a bit of oil in a wok or deep pan and fry each roll lightly on all sides until they colour a little. Put them on kitchen paper to drain the excess oil and eat immediately. This is how: You roll the spring roll into a salad leaf with a mint leaf or two and you dip into the sauce before devouring with glee! It’s messy and delicious. This is evidently a weekend recipe, for when you have a bit of time and can invite some friends around to pat you on the back! Who doesn’t need that?! I dedicate this to Mum and Dad who are soon off to Vietnam! Lucky them. Credit to Sophie Dahl for the frightfully British and always divine recipes of her book “Miss Dahl’s Voluptuous Delights “. I borrowed this one because it is an English classic- if fact, you can’t get more English than this fresh peas and mint combination! The Delicious Miss Dahl makes her with “frozen peas” but why use frozen when pea is the one green vegetable this country seems to produce in abundance?! I used child labour to get these freshly shelled ones but it was worth it. Shelling beans or peas “en famille” is such a relaxing and mind-cleansing activity… why deprive yourself when they are in season?! In a medium size pan, heat 1 tbsp of olive oil and sauté the chopped spring onion for a few minutes. Add the peas and coat them in oil, stirring. Add the stock and mint and cook on low heat for about 10-15 minutes. Season to taste. 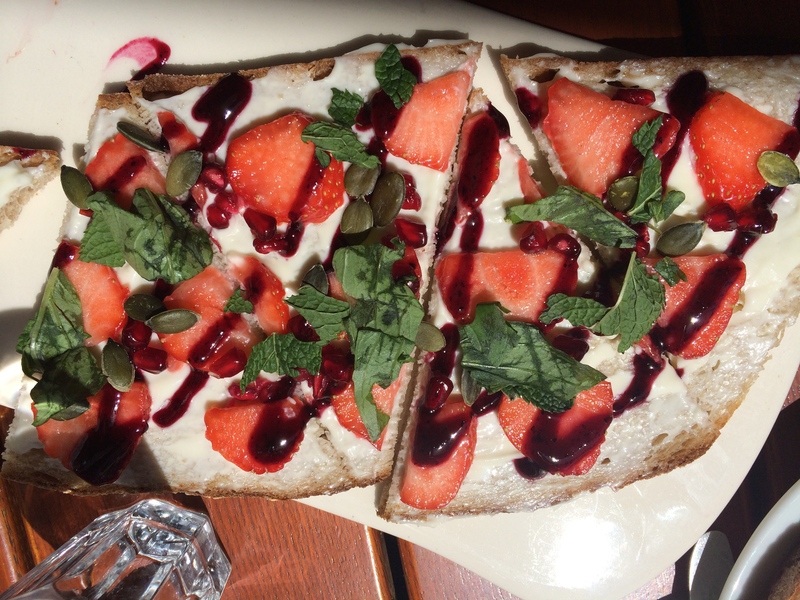 Add some dried mint if you have some- as I did. 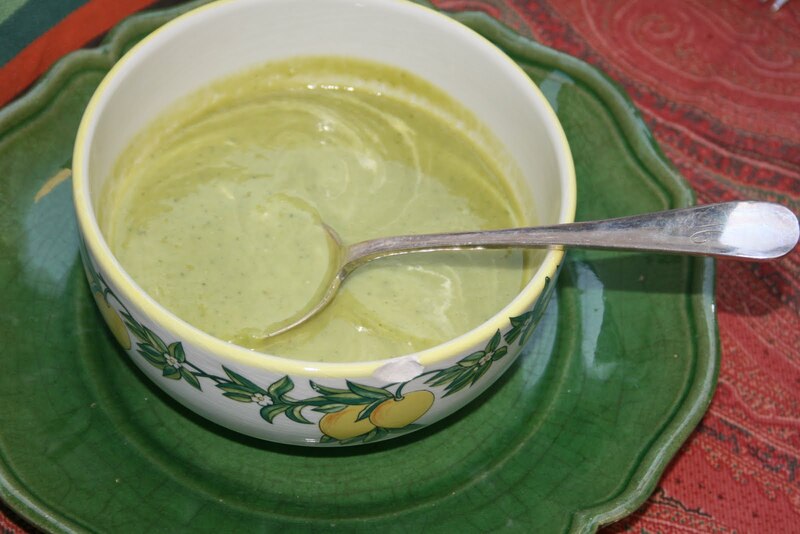 Transfer to a blender and whiz –Here I use a traditional “Moulin a legumes” in stainless steel instead so the soft skins of the peas are sieved out but if the peas are very small and tender, the blender is probably fine. Serve warm or cool, depending on the weather, with a whirl of crème fraiche. Everybody lapped it up and it is now a family favourite! Grate the unpeeled courgettes and brown them with a bit of olive oil and the diced onion. Stir and simmer on low heat until all water has evaporated from the vegetables. Whisk the eggs in a bowl, then mix the cream and cream cheese with the salt and pepper. Incorporate the feta by crumbling it in between your fingers. 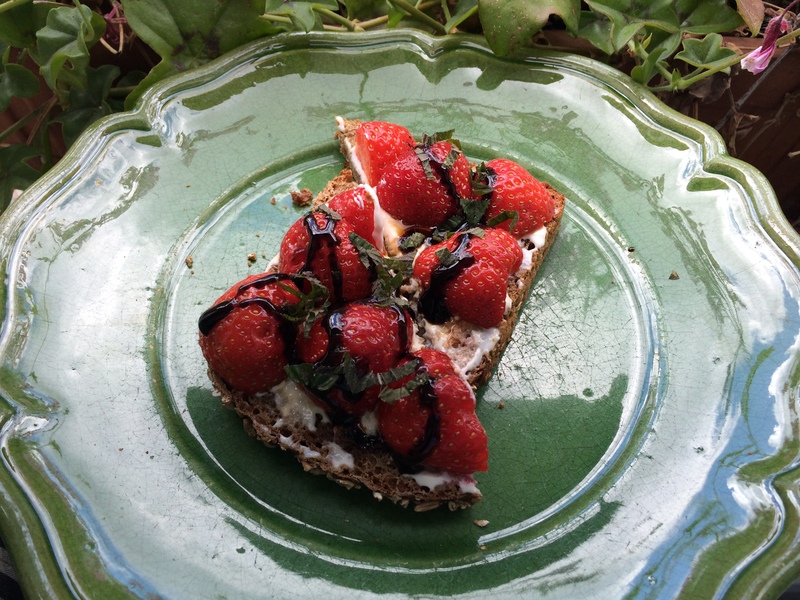 Add the chopped mint – I also used some dried mint flowers I had bought in Greece some time ago and found it still smelt wonderful! Like Thyme flowers, this is a very special ingredient if you happen to find it in a market on holiday or to collect it yourself. Butter your tin, pour the preparation inside and put in a warm oven (170° C.)for about 30 min. 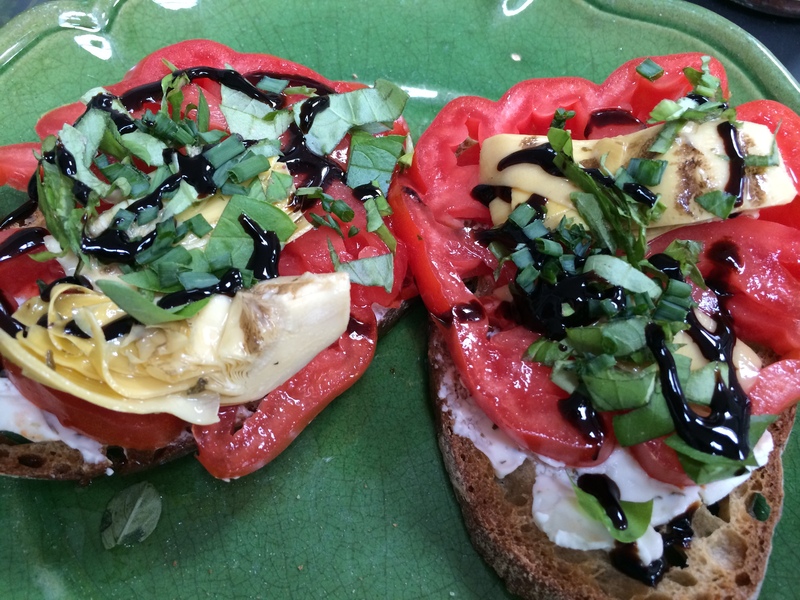 Serve cold with a tomato coulis (cold tomato sauce) or hot tomato sauce. A perfect picnic dish bringing back wonderful memories of Greek holidays and sunshine, of finger-food on the boat and al-fresco lunches in sea-side tavernas. This is the best thing about food: you may travel on the smell of a dish or on a forgotten taste suddenly rediscovered as if it were on a flying carpet. You get a whiff of wild mint and suddenly you are spread-eagle on a soft meadow bed, looking at the clouds overhead and chewing a wild fennel stem.